We know that a lot of your pick-up and drop-off points are likely to be regular amongst your customer base. Taxi Hub is set up so that it can allow you to enter details into the system as quickly as possible. For instance, a regular pick up point could be The Blue Anchor, 50 Coinagehall Street, Helston. To save time when entering jobs Taxi Hub’s shortcuts area allows you to assign a small abbreviation to any pick up point you choose. For this example we have chosen BA. When adding a job in the future that is a pick-up or a drop-off at the Blue Anchor, in the ‘Add a job form’ you will only need to put BA into the form and it will ask you if your pick up point is from the Blue Anchor, 50 Coinagehall Street, Helston, this ultimately allows you to enter full addresses only once, and would be worthwhile for regular pick-up or drop-off points. 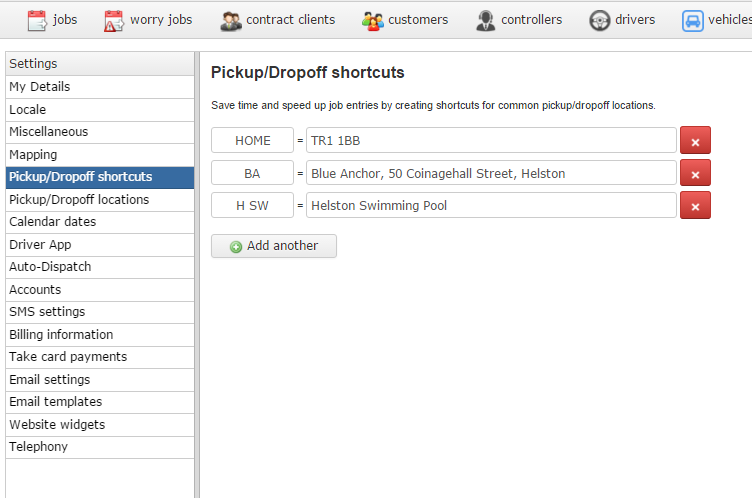 In the settings simply click on ‘Pickup/Dropoff shortcuts’ tab on the left hand side. Short cuts will significantly speed up the process of adding jobs to regularly visited locations. How do i add an extra drop off or more. I can add pick ups but not drops?